BH Fitness G6414V Treadmill is a residential treadmill and has nearly all the features required in a standard treadmill. Thanks to the ECO MODE button, a world first, you can save an average of up to 25% on power consumption from BH Fitness Treadmills. SDS and elastomers are its additional features. BH Fitness G6414V Treadmill comes with 6 elastomers shock absorbing system+ K-Dumper-Prevents muscle and joints injuries. The K-Dumper Soft Control absorbs some of the impact caused by running, extending the life of elastomers and the running board. 2.5 HPP motor-Provides a quiet yet powerful speed between 1~16Km/h. The latest cost of BH Fitness G6414V Treadmill will be updated soon. *Note: Most of the sites, stores or shopping portals listed above sell BH Fitness G6414V Treadmill with discounts and other exciting offers. 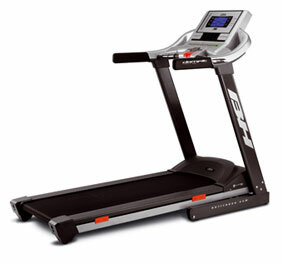 There is a possibility that the some of above websites are not selling BH Fitness G6414V Treadmill now. Toughtrain.com is not liable for such cases or instances. Also we do not recommend any seller for BH Fitness G6414V Treadmill and a buyer should buy from where he/she gets best deal with quality of products, service and on time delivery (shipment). I’ve been using this treadmill for the past 2 days, and considering I’ve worked with commercial treadmills at Gyms, I can surely say that this is really good. The price that I got it for (about $830 in Qatar) is great compared to its prices online. The main thing is that it’s worth every penny of that so far. It’s soft on the feet; the immediate change buttons for incline and speed are extremely helpful (a feature you don’t normally find in many treadmills), the fold is pretty easy and it automatically goes down when releasing, and the fan works great. It’s also easy to operate as my wife, who never ran on a treadmill, started to use it seamlessly. Overall, we’re very happy with it, and I think it’s one of the best options for home use.